Lloyd Haft. 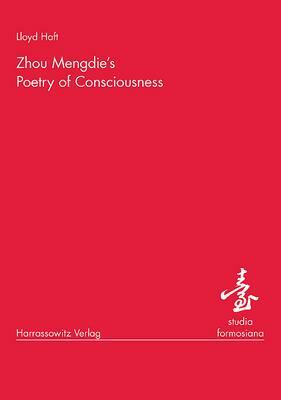 Zhou Mengdie’s Poetry of Consciousness. Wiesbaden: Harrassowitz Verlag, 2006. 108 pp. Paper. Euro 38.00. ISBN 3-447-05348-8. Reading Lloyd Haft’s deceptively pithy and genuinely trenchant monograph on the eremitic poet from Taiwan Zhou Mengdie 周夢蝶 (b. 1921; original name: Zhou Qishu 周起述 ) reminds me of why I got hooked on Chinese literature in the first place. Haft explores Zhou’s verse from a variety of angles that are all ultimately, though perhaps schematically, summed up by two points: one, that the theme of consciousness unites the various perspectives on Zhou’s work; and two, that his poetry exhibits on different planes and in different ways a tendency that Haft calls “reversibility.” Throughout the book, what we are treated to is sensitive interpretations of the craft of a major contemporary (linguistically) Chinese poet who is very challenging but in the final analysis rewarding to those willing to spend the time mulling over his poetry. It is likely that no Westerner has dissected Zhou’s oeuvre as thoughtfully as Haft has in the 25 years since he first encountered it, and there are not many comparable Chinese-language treatments either. That Zhou is not exactly a household word in Chinese studies, I would attribute to three causes: first, he is eremitic. As an adherent to a sort of syncretic mixture of Buddhism and Daoism (at least that is what his work indicates), Zhou not only writes of meditative and quietist themes, he lives such a life himself. Such people are not given to much in the line of self-promotion. Second, he is a mainlander (waisheng ren 外省人) who went into exile in Taiwan during the great exodus of the late 1940s. Even the most illustrious of these writers, such as Bai Xianyong or Yu Guangzhong, have received a great deal less attention, at least outside Taiwan, when contrasted with peers who remained in mainland China. And third, he is a poet, and contemporary Chinese poetry has fared far worse than fiction has in terms of the amount of scholarly attention paid to it in the West. But that is gradually changing, thanks in part due to the early work of people like Angela Palandri, Julia Lin, and Dominic Cheung, as well as the more recent scholarly contributions of Michelle Yeh, Maghiel van Crevel, and Gregory Lee, among others. There has emerged in just the past few years a new generation of Western scholars who are taking contemporary Chinese poetry very seriously. I am hopeful that with this rising tide even more attention will be paid to poets from Taiwan, because their work is of such high literary merit. Which leads me back to my first point–that reading this book is pure pleasure. In part, it returns me to my prelapsarian days before the age of Theory when we were taught in New Critical fashion to embrace the text in and of itself. I found reading Zhou through Haft to be foremost an endeavor that compelled me to get back to the text in as intimate a manner as I was able, though I would not characterize Haft as an exponent of New Criticism. With good poetry, this effort is seldom left unrewarded. And the rewards prove that the lyrical power of verse to militate against differences in geography and historical circumstances are still out there being marshaled by poets as unassuming and unpretentious as Zhou Mengdie, the odd fellow who used to stand on the street corner in downtown Taipei selling books at his used book stall. That is why I would say that no one can have a sufficient understanding of postwar Chinese poetry without an understanding of Zhou’s corpus. He is too important and he has done too many fundamental things with the language, and in such a deep way, to be overlooked by anyone truly devoted to this genre. Lloyd Haft is an able and insightful medium for this poet’s work as it reaches a wider audience in the West. This book is must reading for any literary scholar of contemporary Chinese literary studies. Haft begins his book with an Introduction and Prelude before proceeding with the four main chapters. From the outset, one gets an indication of his distaste for conventional attitudes, arguing against the trend of authoring books that are more “contextual” in approach at the expense of focusing on a single literary subject, a method that naturally implies that this subject may not simply be an amalgam of the various traits of all those of his epoch (9). I would say that single-author studies should and may make a comeback. My own account as to why they are not popular in Chinese studies stems from the publishing market itself: publishers would rather promote a book that covers a period or a theme, one that includes discussions of several writers or even many instead of a concentrated effort on one writer, because they feel the former will sell more copies. I do view the situation slightly differently from Haft, one of whose underlying concerns is that writers are now not viewed as unique individuals. I would say it is possible to view writers both as individuals and as products of a particular historical and social milieu. We will return to this point near the end of the review. Haft’s “Prelude,” as he calls it, is refreshing and unconventional, as well as contemplative, in a manner of speaking. He chooses to take one trope–that of the “shore” 岸–and chart it briefly through the various approaches to Zhou’s poetry that he subsequently employs in the ensuing chapters. Thus, he thinks of the shore and what it would mean for Zhou in terms of his biography, given the fact that he is in exile from the “other shore” of mainland China; he also thinks of it in terms of the “shore” motif in Buddhism, as well as in the philosophical terms of phenomenology, the psychological terms of Freud and dream analysis, and finally in terms of the literary devices that make up the linguistic essentials of Zhou’s verse. These four possible readings, according to Haft, “do not rule each other out” (12). He concludes this prelude by indicating that “consciousness,” as it is understood by the German Phenomenologist and precursor to Existentialism, Edmund Husserl, and “reversibility,” the palindrome effect that plays out in Zhou’s poetry in various dimensions, are the two characteristic features that one can follow through the various perspectives by which Zhou’s poetry may be understood. The first chapter “All Poems are Palindromes: Chiasmus and Other Symmetry Structures” is a very satisfying excursion through the form and structure of approximately fourteen of Zhou’s poems, famous ones and obscure ones alike. The thesis of the chapter is essentially that Zhou’s “poems can be read equally well in reverse order” (18). I am oversimplifing the situation to a degree. Haft explores in detailed analysis of the formal features of Zhou’s poems how Zhou works the language back and forth in such a way as to create new kinds of rhythm and meaning in modern vernacular Chinese. The formal techniques that Zhou favors are things such as palindromes, where words are first laid out and then repeat themselves in reverse order; chiasmus, which strictly speaking is an exact crossing of at least four words in one line “around a central axis” (20); chain argument (a term coined by Arthur Waley) or anadiplosis, where the repetition of words may be spread out through two or more lines; and what Haft calls general “symmetry structure” (21), where elements need merely to be comparable, or in some cases they could be thematic elements and the symmetry could occur in one line or more, in a strophe, or run the entire length of the poem. Haft has perused a great deal of classical scholarship, especially Biblical scholarship, as these structures of symmetry are prevalent in them, to come up with a comprehensive understanding of how they operate in language. There are differing views as to what might be considered chiasmus in the scholarship, with some scholars applying a more strict definition than others. But what is true is that these techniques also exist in classical Chinese, and Haft gives examples from the Daode jing, the Nineteen Ancient Poems (gu shi shijiu shou古詩十九首) and Recent Style (jinti 近體) or Regulated Verse (lvshi 律詩), as well as from other sources, just to illustrate how pervasive the phenomenon is in Chinese writing. Haft also notes that Michelle Yeh devotes a chapter of her book Modern Chinese Poetry: Theory and Practice to what she calls “circularity,” a type of symmetry not unlike what Haft is talking about. For Yeh, these symmetrical structures that create spatial unity but can also signal a “closed state of mind” or even “convey feelings of frustration or futility” (41) are prevalent in modern verse, and they can include motifs (36) as well as formal linguistic elements. Haft uses an example from Shang Qin 商禽 that Yeh discusses in her book as a way of illustrating, in this case, anadiplosis (chain-argument) or what Yeh refers to as “a circle of chain links” (37). In the case of Zhou Mengdie, the symmetry structure is “demonstrable without any interpretation of the poem’s content” (38). It is usually much more tightly defined and local rather than governing the structure of whole poems. Nonetheless, Haft sees the phenomenon in Zhou’s work as “complementary” to what Yeh has discussed in the works of others. He suggests that, rather than conveying a sense of closure, in Zhou’s poetry the techniques signify a “continuously opening mind” and a sense of “freedom” (41). Most important, they can create a sense of formal openness at both the beginning and the ending of a poem, suggesting it could continue beyond the text (21) or that it can signal a reversal of agency, of subject and object, of the doer and the done (25-26). These two excerpts from “On the Evening of Things” (Qi wu lun 齊物論) are different types of the same sort of chiasmus, circularity, or chain-argument that fall under the general rubric of what Haft calls symmetry structures. And they achieve the same broad ends as well. Zhuangzi’s second chapter, the longest and arguably the most important in the book, is a lengthy polemic against absolute certitude that works on the metaphysical level (what is the nature of reality?) as well as the epistemological level (what is the most authoritative account of the nature of reality?). The critique of the Mo’ists (mojia 墨家) and Ruists (rujia 儒家) can essentially be boiled down to the fact that one school affirms what the other negates and vice versa. Indeed, this is the predicament, Zhuangzi opines, of the Hundred Schools (zhu zi bai jia 諸子百家) in the pre-Qin period, each vying to be the ultimate authority. The result on the level of argumentation is skepticism. The result on the metaphysical level is no different, as Zhuangzi uses the symmetry to illustrate the incapacity of language to ascertain the original cause. Although this ineffability or even incapacity to ascertain may seem disheartening, for a poet such as Zhou Mengdie it is precisely at the point of realizing this predicament that poetry can come into being. For poetry is nothing if it is not the failed yet lyrical attempt to express the inexpressible, to think the unthinkable. Indeed, there is something to the melancholy that Yeh identified in her examples of circularity in modern Chinese poetry, but this melancholy is a bit like the blues–without it, there would be far less to sing about. Symmetry structures serve two other literary purposes in the modern poetry of someone like Zhou Mengdie. Given the fact that lyrical forms such as anadiplosis are prevalent in classical Chinese poetry–the Shijing, for example, is filled with it–that Zhou utilizes it creates a sort of lyrical connection with the tradition of Chinese poetry. Modern Chinese poetry has long bridled under the scrutiny that comparison with its illustrious pre-modern counterpart invites. Using such “native” forms can have a salutary effect on that. One challenge in modern Chinese poetry is how to recast verse in a vernacular form that is not simply prose sliced into lines, on the one hand, or lines that rigidly and awkwardly adhere to Western prosodic conventions, on the other hand. One way to square the circle is by using symmetry structures to create rhythm and even loose rhyme schemes in order to invest the poetry with a sense of lyricism, unity, and coherence. The sort of reversals that occur in language also operate on other levels in Zhou’s poetry, including the notion of identity and differences among human subjects. Thus, in Chapter Two “Poems, Dreams and Dream Poems,” Haft explores the notion in Zhou’s poetry that “the boundaries between people are illusory” (55-56). He shows from a reading of a classical Chinese poem and a modern Dutch poem and through his understanding of Freudian dream analysis that surface imagery can reveal submerged meanings that actually become the opposite of the ostensible intention of the literal text. Noting that it was Freud’s observation that “every element of a dream can be interpreted by its opposite,” Haft shows how some of Zhou’s meditations on Buddhist themes can be paradoxically “sensual” renderings of some high aesthetic themes. And just as reversals can occur at the level of language itself, so too on the level of identity can there be an interchangeability of subjects (i.e. “I” and “you”) wherein the distinction between creator and created can be obliterated. Haft gets most deeply into his Husserlian reading of Zhou Mengdie in Chapter Three “Body and Consciousness.” As a way of making sense of the bizarre incongruities in the imagery found in Zhou’s poems, Haft turns to this important Phenomenological thinker. Husserl, the father of Phenomenology and a precursor to the Existentialism of thinkers such as Martin Heidegger, argued that the mind has no thought that does not have an object. This notion, that the mind “intends” objects, known as “intentionality,” is the bedrock notion of phenomenology. The basic tenet is that consciousness is always consciousness of something. Consciousness is inextricably wedded to the world, and the world as perceived by the mind is nothing outside one’s consciousness of it. Husserl thus privileges consciousness above all else, especially in his influential series of lectures published in English under the title Cartesian Meditations. Haft mainly relies on secondary readings of Husserl, in particular the writings of Dan Zahavi, A. D. Smith, and Steven Laycock’s comparative approach to Phenomenology and Buddhism, to come up with an approach toward reading the subject and intersubjectivity in Zhou’s poems, pointing out that “there is an inherent ‘constitutional’ relation between the lyrical subject and its world” (67). From this perspective of the mutually constitutive relationship between subject and the world, it is only one step to the next proposition, which is that “the subject,” as an “organ of experience,” can “create” the world. The connection between Zhou Mengdie and thought and religion is virtually a prima facie one, given his ample reference to Daoist and Buddhist themes and terminology. But the meshing of Phenomenological thought with this verse is ingenious, as it unlocks the door to understanding the bizarre, one could say illogical or inexplicable, quality of Zhou’s imagery, imagery that resists, if not defies, easy interpretation. In Zhou’s poem “The Instant” (chana 剎那), for example, one is asked to understand how one can pick up the earth “as small as a pigeon’s egg” (xiao ru geluan 小如鴿卵) . If consciousness itself is constitutive, as Haft argues, then it makes sense that such “massive” objects could be “the lyrical subject’s own creation” (68). Haft pushes this concept further by stating that the subject can both create the world and be created by it, thus bringing the reader back, in a philosophical way, to the formal and psychological insights of the first two chapters, the ultimate conclusions of which were that there is in the work of Zhou Mengdie a complete commerce between subject and world, an open-ended relationship in which agency can be reversed and reversed again. The extreme view of this, Haft suggests, is the Buddhist one that the idea “of the Creator is actually contained in the ‘belly’ of the created” (70). But what of other minds, other “consciousnesses”? Would this not pose a problem to the constitutive relationship between consciousness and the world? In reading Zhou’s “Listening to the Source” (ting quan 聽泉), Haft argues that the fact that there are multiple centers of consciousness is “an essential element in Husserl’s concept of the constitutive process” (74). Haft shows in the latter part of this chapter–through a reading of several of Zhou’s poems that in various ways ponder the “many selves” (76) of other perceivers and hanker for the “different pair of eyes” that would render images “all the clearer” (78)–that we are at once rooted in our bodies and at the same time surrounded by “other potential centers of consciousness” (76). A realization of this intersubjective condition permits the sort of “rebirth[s] into a wider point of view” (80) that Zhou seems to search for in the abstruseness of his imagery. I could not agree more with Haft’s assessment of the poet’s predicament in Taiwan. In fact, this predicament of exile that such authors of his generation faced, with allowances for personal belief, literary style, personality, etc., is similarly “resolved” in textual fashion in their own works. Lloyd Haft’s monograph on Zhou Mengdie is concise but rich in detail and insight, profound but limpid in expression. His work eschews the types of literary theory whose employment has become convention in the past fifteen years; however, his approach is not a throwback to New Criticism or traditional Sinology. Rather, taking the Phenomenology of Edmund Husserl as his primary compass, and forging it together with many years of careful reading and reflection on the poet’s work, not to mention the scholar’s knowledge of Chinese literature in general, Haft presents his reader with a deeply thoughtful and challenging reading of one of the literary titans of postwar Chinese poetry from Taiwan. In reflecting on his approach, I still wonder whether the work of Heidegger might also prove to be an illuminating vantage point from which to understand Zhou’s work . The test of an approach in my mind is whether it can successfully provide a key to understanding the work of an author that makes sense when applied to significant portion of her or his work as a whole. Lloyd Haft does exactly that in superb fashion in this exemplary work of scholarship. Haft’s book was already written and in press by the time Zeng Jinfeng’s 曾進豐 book Zhou Mengdie, the Whirling Poet娑婆詩人周夢蝶 (Suopo shiren Zhou Mengdie), an important work, had appeared. He therefore wasn’t able to consult it, but he did read Zeng’s M. A. thesis and makes reference to it. Another important and recent addition to the Zhou Mengdie scholarship is Luo Renling’s 羅任玲 Natural Aesthetics in Taiwan’s Modern Poetry 台灣現代詩自然美學 (Taiwan xiandaishi ziran meixue) (Taibei: Erya, 2005). Luo devotes fully 120 pages to Zhou and his poetry. Liu Yongyi’s 劉永毅 Zhou Mengdie: Ascetic Monk of the Poetic World 周夢蝶詩壇苦行僧 (Zhou Mengdie shitan kuxingseng) is of some value and is cited by Haft. Article and chapter length works on Zhou in Chinese that are worth consulting are those by Luo Fu 洛夫 , Ya Xian 弦, Guangzhong 余光中, Xiao Xiao 蕭蕭, and Ye Jiaying 葉嘉塋. The scholarship and criticism on Zhou’s verse is nowhere near as voluminous as that on Yu Guangzhong, Zheng Chouyu 鄭愁予, Luo Fu, or even Ya Xian, who basically gave up writing poetry long ago. New York and New Haven: Yale University Press, 1991. These two passages can be found on pages 63 and 79, respectively, of the Qing dynasty edition of Zhuangzi’s work: Guo Qingfan 郭慶藩 , ed., Zhuangzi and Collected Commentaries 莊子集釋 (Zhuangzi jishi), (Taibei: Zhuangyan, 1984). The latter passage resonates with Haft’s reading of Zhou, because Zhuang concludes from the conundrum of the unfathomable beginning that “I” am one with the “myriad things” 萬物 . Quoted from Zhou Mengdie, Goddess Incarnate 還魂草 (Huanhun cao) (Taibei: Wenxing Shudian, 1965), 109-111. The translation is my own; it also is translated by Angela C. Y. Jung Palandri in Modern Verse from Taiwan (Berkeley, Los Angeles, and London: University of California Press, 1972), 67. Other poems that use the mirror image include “Under the Bodhi Tree” 在菩提下 and “The Round Mirror” 圓鏡 . See Edmund Husserl, Cartesian Meditations: An Introduction to Phenomenology. Tr. Dorian Cairns, (The Hague: Martinus Nijhoff, 1973). Do not be fooled by the title. It is the real thing, and it is dense. A clear, concise and cogent introduction to Phenomenology is Richard Zaner’s The Way of Phenomenology: Criticism as a Philosophical Discipline (New York: Pegasus, 1970). There are two hesitations I have regarding using Husserl to understand literature in general and especially non-Western literature. The first is that Husserl wrote at a time of deep crisis in Western thought. The eventual result of that crisis was a fundamental schism between Continental Philosophy and Anglo-American Philosophy. Great doubt was cast upon Western thought in the late 19 th century and there was deep suspicion of its efficacy and sustainability as a rigorous discipline. Husserl’s response to this was to advance an even more rigorous, or “scientistic,” form of philosophy, as can be seen in his two essays contained in the book Phenomenology and the Crisis of Philosophy Tr. Quentin Lauer (New York: Harper Torchbook, 1965), especially “Philosophy as a Rigorous Science.” Heidegger rejected this rigorousness in favor of a more “poetic” approach to philosophy, eventually rejecting metaphysics altogether. The second is that Husserl, particularly in the Cartesian Meditations, is highly concerned with the ego and the cogito, mainstream Western philosophical categories since the time of Descartes (hence the name of the book). He advocated cutting out all other realms of inquiry and focusing strictly on “consciousness.” That, to me, is rather alien from Chinese thought, at least until Neo-Confucianism. In this respect, I find Heidegger in greater harmony with traditional Chinese thought, as he was a severe critic of Western rationalism and its obsession with the cogito as the starting point for metaphysical inquiry. An illuminating account of the influence that Daoism had on Heidegger’s own thinking is Otto Poeggeler’s “West-East Dialogue: Heidegger and Lao-tzu” (translated by Graham Parkes) in Graham Parkes, ed. Heidegger and Asian Thought (Honolulu: University of Hawai’i Press, 1987), pp. 47-78. Poegeler is a direct disciple of Heidegger with much first hand information. It is suggested that Heidegger’s only reluctance against writing more extensively of Daoism in particular came from his lack of knowledge of the Chinese language and feeling that to write at length of a system of thought whose language one did not know would be to invite ridicule. See her Literary Culture in Taiwan: Martial Law to Market Law (New York: Columbia University Press, 2004), especially pages 90-121. Chang’s work is certainly relevant on a supplementary basis to understanding Zhou’s poetry. In her discussion of the “China” trope, for example, she reveals how imaginings by three “mainlander” essayists of China are a sort of synecdoche for the broader set of exiled authors from China in Taiwan in the postwar period, allowing for nuances among the writers. In addition to this, I would also suggest that Chang’s reading of Yu Guangzhong’s neoclassical stance, a recuperation of traditional Chinese tropes in combination with techniques from the West, stylistic choices that he sees as not being mutually exclusive, were influential on other poets of his epoch. This discussion adds further context and perspective to Haft’s treatment of Zhou in a complementary, not contradictory, way. See Chang, 99-102.